BladeRunner 6402BR. Outdoor Power Replacement Belt, MTD, Murray, AYP, Bob-Cat, Homelite, Simplicity, Snapper, Toro, Exmark. 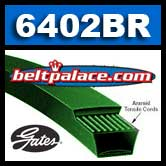 Genuine Gates Product 922756402.